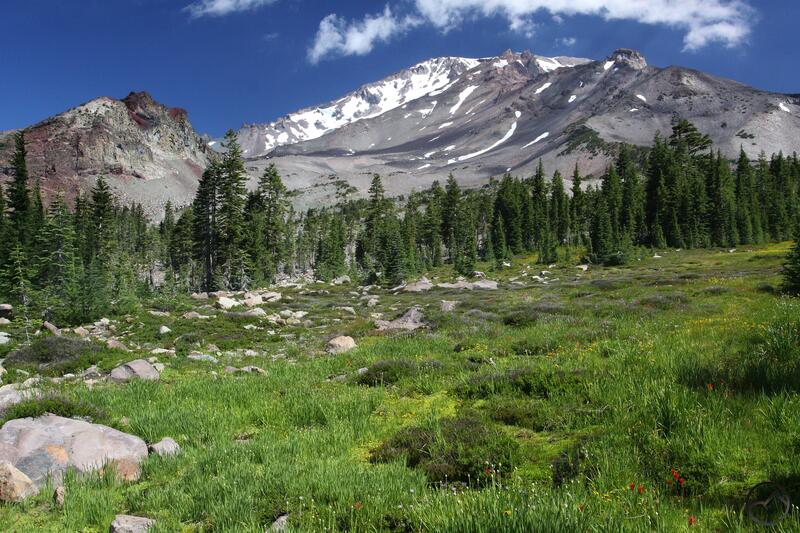 A short, easy trail high on Mount Shasta through delicate Panther Meadow that combines most of the best features of hiking on the mountain. This is a great introductory trail to California’s best peak. 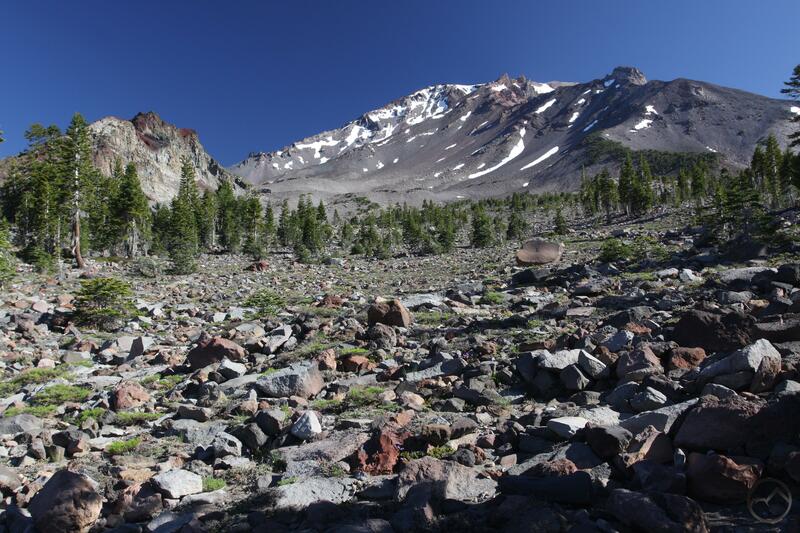 Mount Shasta is indisputably one of the most spectacular hiking destinations in Northern California. Exploring the rugged terrain near the timberline, beautiful rocks and cliffs, staggering vistas of the volcanic peak, fantastic views of the surrounding mountain ranges, rushing creeks and delicate meadows are all highlights of the trails on the mountain. 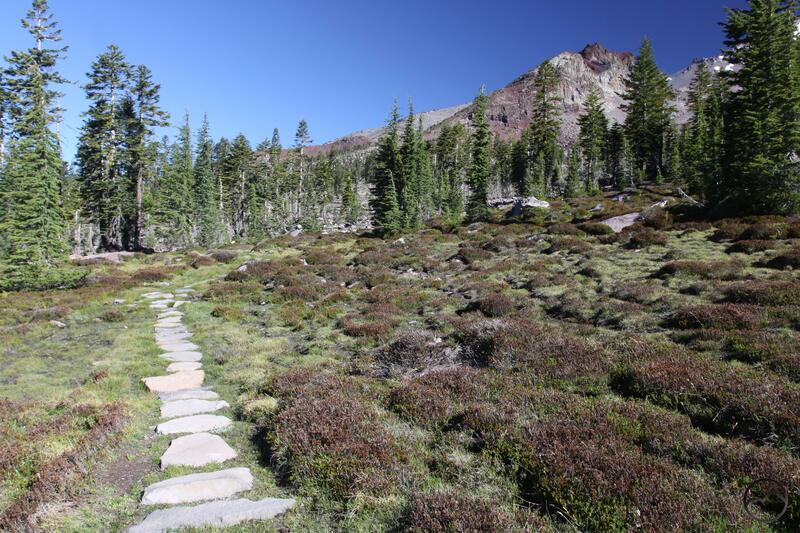 While all of these features are present in varying degrees on most of Mount Shasta’s hikes, none offer all of them in such a complete, easily accessible package as the trail through Panther Meadow. Though it is a diminutive trail in terms of length and difficulty, the trail through Panther Meadow is a giant when it comes to scenery. Boasting constant views of Mount Shasta and Green Butte, there are also plenty of chances to observe stark Gray Butte. The trail also has numerous opportunities to enjoy a great perspective on the Trinity Divide and the distant Trinity Alps. All of these views are had while looping around a small but gorgeous alpine meadow. It is hard to believe that such a short trail can still be so awe-inspiring. The barren volcanic land is a contrast to the meadow. 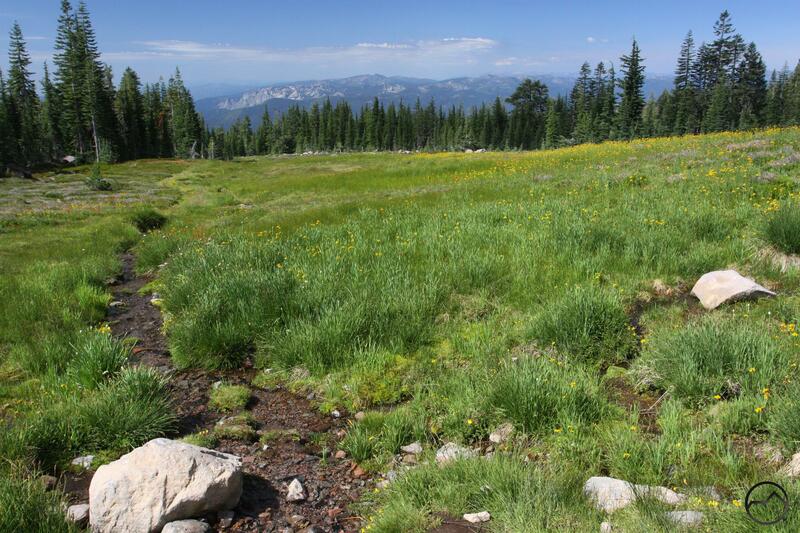 Panther Meadow exists because of a spring that waters Mount Shasta’s barren volcanic soil. Where the water reaches life thrives. Since the spring is not large, the meadow itself is not extensive. It is divided into an upper and lower section separated by a band of hemlocks. Both sections have wonderful views of Mount Shasta but where the lower meadow lies in the shadow of Gray Butte and has a good perspective on that scenic mountain, the upper meadow is a great vantage from which to look to the south and see the craggy peaks of the Trinity Divide and Trinity Alps. The meadow is fragile and the Forest Service has made efforts to keep hikers on the trail so as not to further mar the grasses. 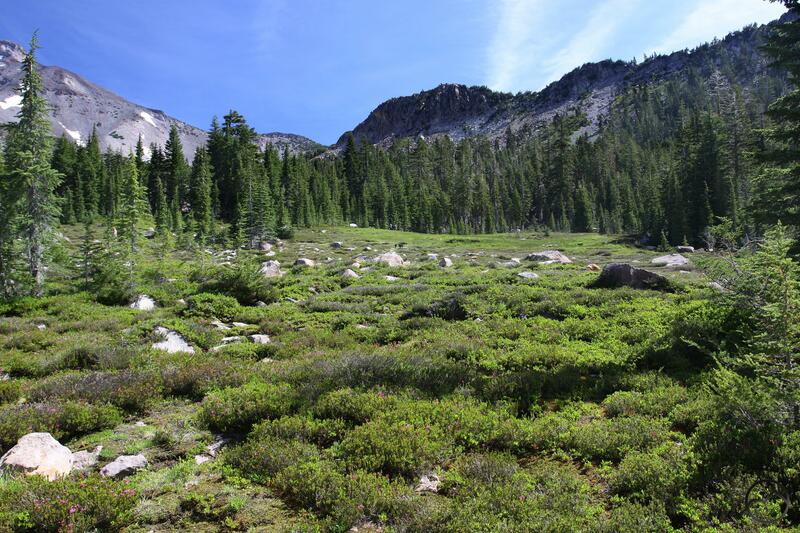 The area around the meadow is typical of high elevation environments on Mount Shasta. Rocks are plentiful and the soil is poor, providing a remarkable contrast between the meadow and the area around it. Many people hold Panther Meadow to be a sacred place and it is not uncommon to come upon individuals meditating or performing other rituals and ceremonies. Whatever ones beliefs, please show everyone in the meadow respect and consideration and enjoy this incredible place. A section of lower Panther Meadow. From the parking lot at the Panther Meadow campground, follow the wide, dusty path to the east. Much of the trail through here is lined with rocks, which form definitive borders for the trail and hopefully minimizing hikers’ off-trail exploration and impact on the delicate landscape. 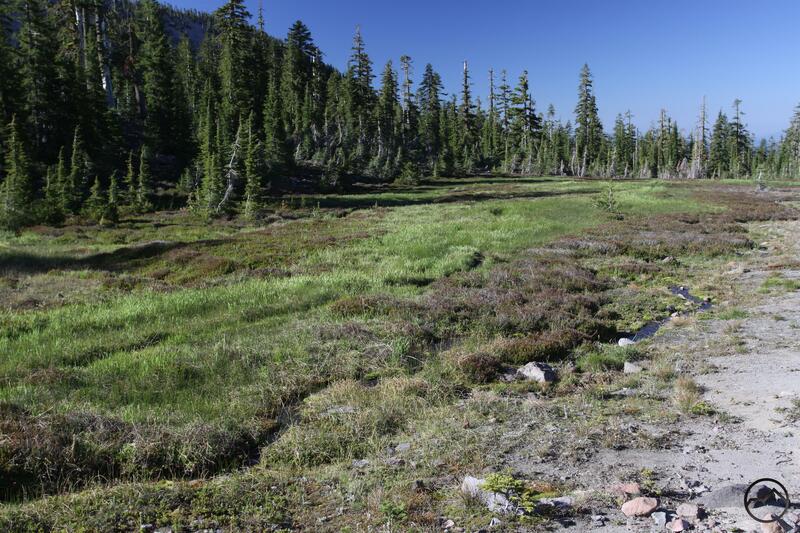 The trail passes of campsites before it leaves the forest behind and arrives at the lower section of Panther Meadow. A little over 0.1 miles from the trailhead the path splits. Going to the right crosses the lower meadow and leads to the trails destined for Gray Butte and exquisite South Gate Meadow. The section of the trail that crosses the meadow has excellent views of Mount Shasta and Green Butte. Looking to the west this part of the meadow is also a terrific vantage from which to observe the sheer wall of Gray Butte. Even if South Gate Meadow and Gray Butte are the intended destinations, it is worth it to stroll this section of trail and enjoy the great scenery. To hike the Panther Meadow Trail stay to the left and skirt the edge of the grassy field. The sounds of water running get louder as the trail nears the northern end of the meadow. Great view of the Castle Crags from the upper meadow. At the northern edge of lower Panther Meadow the trail moves in parallel to the creek and soon enters a dense copse of mountain hemlock. The path begins to climb moderately. In the midst of the trees to the right of the trail, the nearby creek can be seen and heard. After climbing over 100 feet in a little over 0.1 miles the path finally emerges at the edge of the upper meadow. It is an exceptionally scenic spot with Mount Shasta and Greet Butte towering powerfully over the rock strewn green grass. At the edge of the meadow the trail arrives at another fork, which is the beginning of the Panther Meadow Loop. Stay to the right and cross the spring-fed creek before reentering the forest. The path climbs very moderately for another 0.1 miles before coming to another trail junction. Follow the path to the right and skirt the uppermost section of the meadow before arriving at the spring that feeds Panther Meadow. Quarried rock lines the small pool from which the water wells up. The water runs off as a creek, carrying the life-sustaining moisture into the grassy paradise that is the upper meadow. From the spring, the views to the south are tremendous, taking in the Castle Crags, Grey Rocks, much of the Trinity Divide and a significant portion of the distant Trinity Alps. Stones form a pathway across the upper meadow. Returning to the main trail, the path soon arrives at the edge of the meadow again. Cross the lush grass via a series of large stones that have been arrayed to facilitate the crossing of the meadow without damaging the fragile grasses. The views from the path are, not surprisingly, superb. On the far side of the meadow the trail continues to the west, entering an area that is choked with small boulders. The trees in this area are smaller and further apart, indicating that this area is getting close to the timberline. The path heads west through the boulder with consistently good views for just short of 0.1 miles before reaching a junction. Proceeding straight ahead will lead to the parking lot that accesses the short trail to upper Panther Meadow. Turn left at the junction and make a short descent through the boulders back to the beginning of the loop at the southern end of the upper meadow. Enjoy the view briefly before heading back down the trail to the lower meadow and the campground parking lot. From I-5, take the Central Mount Shasta exit. Merge onto Lake St. and head east for 1 mile, passing through the intersection with Mount Shasta Blvd. As the road bends to the north, continue onto Washington Street for 0.1 miles before continuing onto Everitt Memorial Highway. Once on this road, continue for about 12.5 miles to the Panther Meadow Campground for the Panther Meadow trailhead. For hikers only interested in the upper section of Panther Meadow, there is a trailhead a short distance up the road from the Panther Meadow Campground. It offers a short, easy 0.7 loop. John, head east on Highway 80, take 505 North to cut over to Highway 5 heading north. When you reach Mount Shasta (town), way up north, take the mid-town exist (West Lake Rd) and head east into town. Continue on this across town, eventually it becomes the Everitt Memorial Highway (A10). This leads up into the mountain. 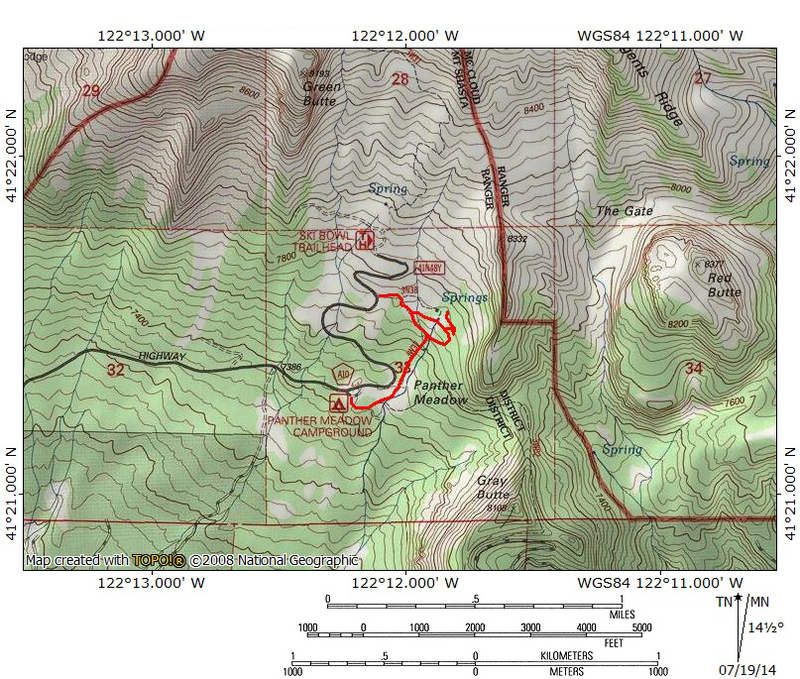 Panther Meadow Campground is fairly near the top of the road, you can see the topo map in this article. I am not sure if you meant this as a comment on one of my pages. Your friend may not see it there. Was this supposed to be an email? No words, just tears for you Wintu Tribe. No one respects your plea to let your mother earth be. The center, your genesis! They come and camp, hike , and desecrate your land once again. I’m so ashamed to be of white european heritage i shouldn’t have been. One day this land and earth will be yours again. I believe this! The gate at Bunny Flat as of 11-20-18 was locked restricting access by car to panther meadow 2.5 miles beyond the gate. I believe this is a seasonal closure but not fully sure. Be aware that in the late Fall you may have to add 5 miles of walking if you’d like to walk the short loop at panther meadow described in this article. If anyone can clarify the dates of closure re: the gate at Bunny Flat this would be useful to those reading this web page.